Eagle Ford Shale Play, Texas Railroad Commission Well Map (as of June 1, 2017). For current map information, please visit the new Texas RRC GIS Viewer Map page. DeWitt County sits atop what is known as the Edwards Reef Trend in South Texas. Natural gas has been targeted for several years in the county. 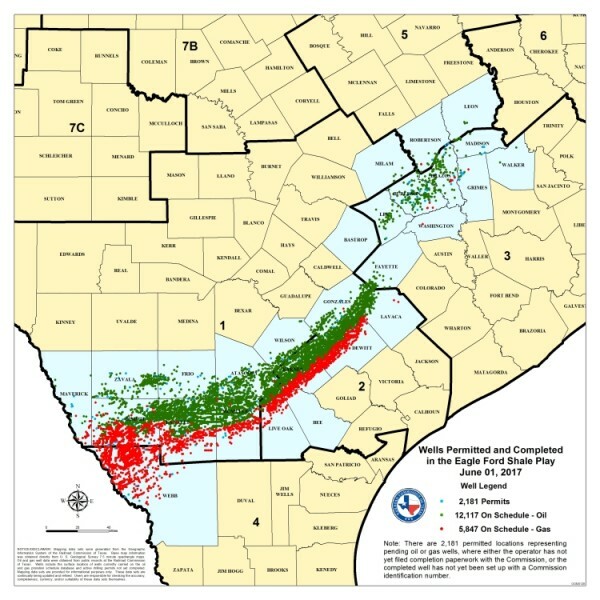 Development has now shifted to the Eagle Ford Shale, where companies are targeting both oil and gas. County services of interest to oil and gas lease owners include the Dewitt County Appraisal District (tax collector) and the Dewitt County Clerk (property records) office. The county seat is Cuero, approximately 80 miles southeast of San Antonio, TX. The town of Cuero bills itself as the “Turkey Capital of the World”. Other communities in DeWitt include Hochheim, Meyersville, Nordheim, Pearl City, Westhoff, Yoakum, and Yorktown.